All of these lakes have been recommended as good early season Walleye lakes. We continue to attempt to spread the fishing pressure around and to mix things up for those of you that have been dedicated in joining us year after year. 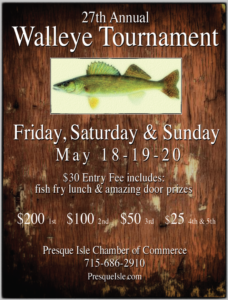 Be sure to join us at check-in and welcome at 10am on Friday, May 18 at the Presque Isle Community Center to pick up your hat, hear from the WDNR and Chamber on tourney rules, and to enjoy some coffee and donuts. Please also make plans to stay on Sunday for a fish fry lunch, cash awards and door prize raffles. Both the welcome and concluding events are hosted at the Presque Isle Community Center. ’17 WALLEYE TOURNEY WINNERS. CONGRATS ALL! 66 fish were caught with the biggest at 23.5″ by Charlie Horton – winner of a rod/reel combo donated by Up North Sport ‘N Gifts. 2017WalleyeResults <– MORE COMPLETE RESULTS and PHOTOS ON FB.